South Asia bordered by India on the east, west & north and by Bay of Bengal on the south and small border strip with Myanmar on the south-east. 147,570 square km-mostly alluvial fertile plain. Territorial Waters 22.22 km. Economic Zone up to 370.40 km. in the high seas, measured from the base line. (Max 29 deg. C and Min 11 deg. C) . Seasons: Summer, Monsoon, Autumn, Late Autumn, Winter & Spring. Varies from 160 cm to 400 cm at different areas. Bangla, English is generally understood and widely spoken. Dhaka, Area 1416 sq. km. Dhaka, Chittagong, Sylhet, Jessore, Rajshahi, Iswardi, Cox's Bazar, Syedpur and Barisal. Colorful tribal life of Hill Tracts, World's largest and longest sea beach at Cox's Bazar, Kuakata and Parky sea beach, Foy's Lake , Dulahajra safari park, Sitakund echo park at Chittagong, century old historical sites at Dhaka, Pharpur, Moinamati, Mohastangar, Sundarban the home of Royal Bengal Tiger and world's largest mangrove forest, lash green tea gardens of Sylhet, reverie life etc. Readymade garments, frozen foods (shrimps), leather, leather products, jute, jute products, tea, ceramic, textile fabrics, home textile, chemical product, light engineering products including bi-cycle. Oil, edible oil, petroleum product, wheat, seeds, fertilizer, yarn, capital goods, machinery, power generating machinery, scientific & medical equipment, iron & steel, motor vehicles, raw cotton, chemicals. The climate is sub-tropical with temperatures ranging from a daytime low 18~ C in the cold season to a maximum of 40~ C in the summer. Annual rainfall ranges from 160-cm. To 2000 cm in west, 200 cm to 400 cm, in the south-east and 250 cm. to 400 cm. in the north-east mainly in monsoon. The country has mainly four seasons, winter (Dec- Feb), summer (Mar-May), Monsoon (June-Sep) and Autumn (Oct-Nov). The winter is the most pleasant season when average maximum and minimum temperatures and 26.6~ C and 13.5~ C respectively. Bangladesh has got a population of about 140 million, making it the most densely populated country in the world, 85% live in rural areas. Density of population per sq. km is 764. There are about a million tribal people. They live in the hilly regions of Sylhet, Mymensingh, Rangamati, Khagrachari and Bandarban. 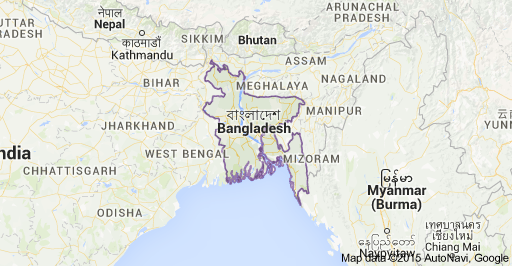 The citizens of Bangladesh are known as Bangladeshi. Bangladeshis are simple, polite and courteous. They are friendly and hospitable towards visitors. The state language and mother tongue is Bangla. English is also spoken and understood. Bangladesh is a land of religious freedom and tolerance. People of all caste, creed and religion live here in perfect harmony. Approximate ratio of population on the basis of religion is as follows: Muslims 86.6%, Hindus 12.1%, Buddhists 0.6%, Christian 0.4% and other 0.3%. Air : Bangladesh can be reached by air from any part of the world. Biman Bangladesh Airline connects Dhaka with 29 major cities of the world. It also operates in 7 domestic routes. Beside Biman, several Leading International carriers fly to and from Dhaka. Rail : The Bangladesh Railway provides an service to please of interest such as Chittagong, Sylhet, Khulna, Mymensingh, Bogra, Rajshahi, Dinajpur starting from Dhaka, The inter city Express service is available to and from important cities at cheap fares. Bus/Coach Services : Road transport in Bangladesh is predominantly a private sector affair. Rates are among the cheapest in the world. Express and non-stop services are available to principal towns from bus terminals in Dhaka. The Bangladesh Road Transport Corporation (BRTC) also maintains a country-wide network of bus service. Tropical in summer and light woolen in winter. Taka (TK) is the unit of currency. The taka is equal to 100 paisa (smallest unit). coins of 5, 10, 25, 50, 100 and 500 paisa are in circulation. Closed on Friday & Saturday. Office House 9.00 am - 5.00 pm. 1. One can obtain for visa before departure from Bangladesh Embassy/High Commission.